colour print from woodblocks, 1858. 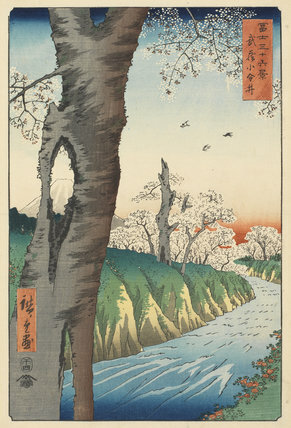 Signature: Hiroshige ga. Publisher's seal: Tsutaya (Tsutaya Kichizo). Fuji from Koganei, Musashi. No. 12 from the series Fuji meisho sanjurokkei (Thirty Six Views of Mount Fuji from Famous Places).